We have some guest appearances here today - Elsa, Anna & Olaf from Frozen. My youngest daughter is turning 5 next month (where did that go!) 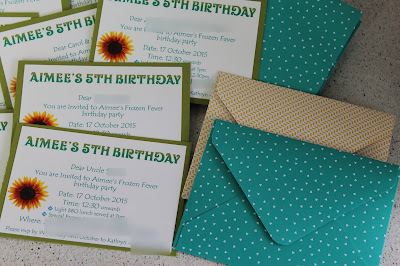 and she has chosen to have a Frozen Fever birthday party. 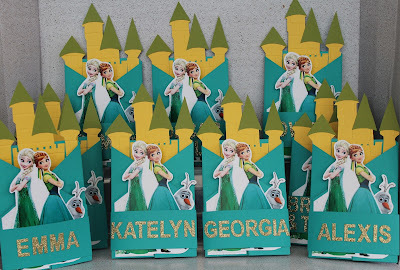 Stay tuned for more Frozen Fever crafts to come. I chose the colours to match Anna's dress - they matched so well to our Bermuda Bay, Old Olive & Daffodil Delight so I've used those. 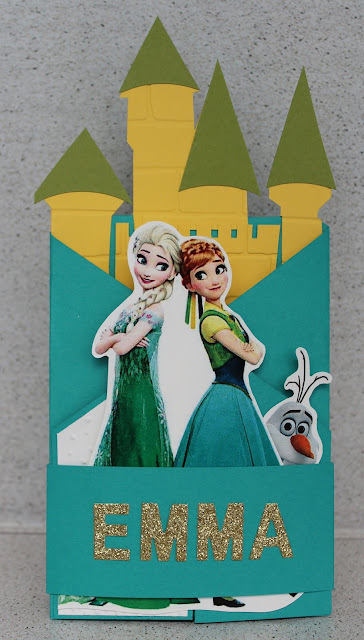 I started by creating my castle (once I had a template I simply copied it to the other invites) and I embossed it using our Brick Wall embossing folder to make it look more castle like. For the side panels I have used our new Softly Falling embossing folder - see how it doesn't have to be snow? Its great when you can find other ways to use your supplies and this is one of them. 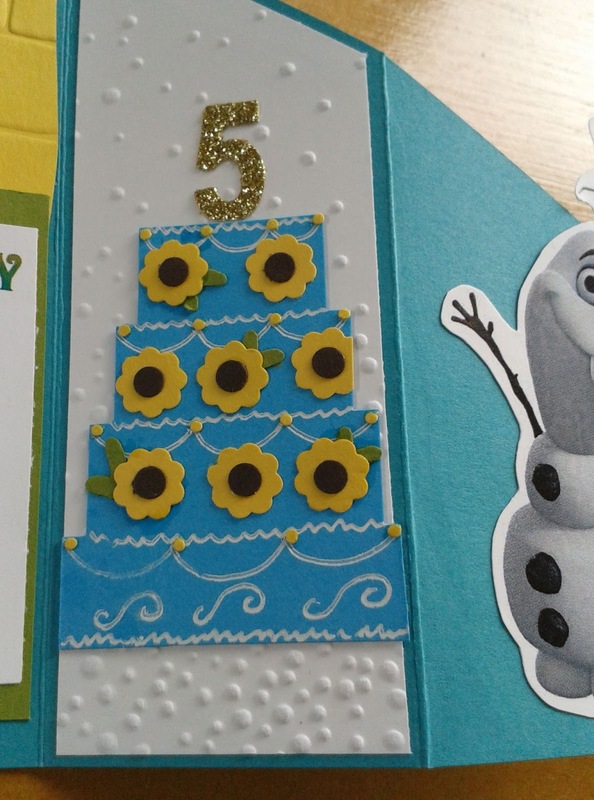 As for that ice-cream cake that Olaf just can't resist... well I created that using tempting turquoise cardstock and drew the icing on with our white gel pen. I punched the flowers from daffodil delight and early espresso cardstock, and if you can just see, I've used part of the tree builder punch underneath for the leaves. 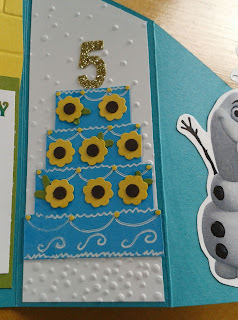 A number 5 on top from gold glimmer paper adds the finishing touch. 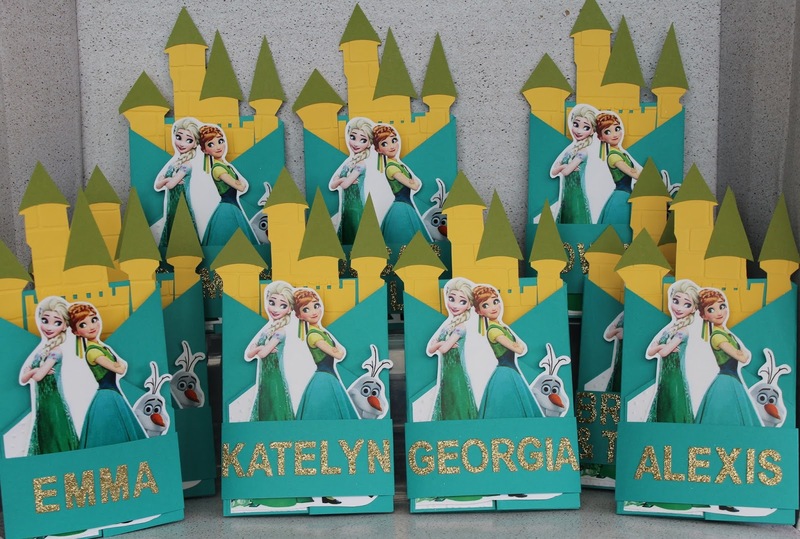 I've also used the gold glimmer paper and our little letters dies to spell out the children's names on the belly bands. 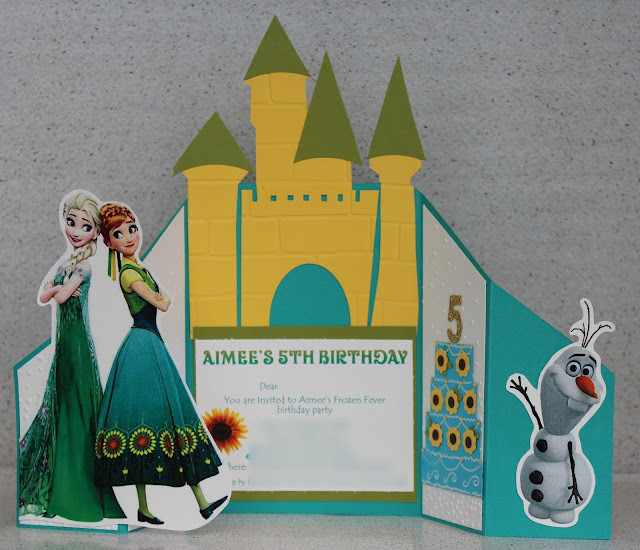 Elsa, Anna and Olaf have been printed on our whisper white cardstock, cut out and they stand on the wings. I love how when the invitation is closed Olaf is peeking out from behind Anna's skirt! The adult's invitations weren't quite so elaborate. I scaled them down and used the same printed inner piece with the details, backed onto Old Olive cardstock (as they are in the kids ones). Then I made some small envelopes for them in matching colours using our envelope punch board. Simple but still effective and the unique envelope might brighten the postie's day. We really do have everything to you need to create some awesome invitations for your next event. Have a go when you next need to send invitations. You'll get some great responses from your guests and the invitations will feel all the more special for the fact that you made them. Thanks to Jen (here) for inspiring me with her design which I have based mine on. Feel free to leave me some comments below too - what do you think of these Frozen Fever invites?